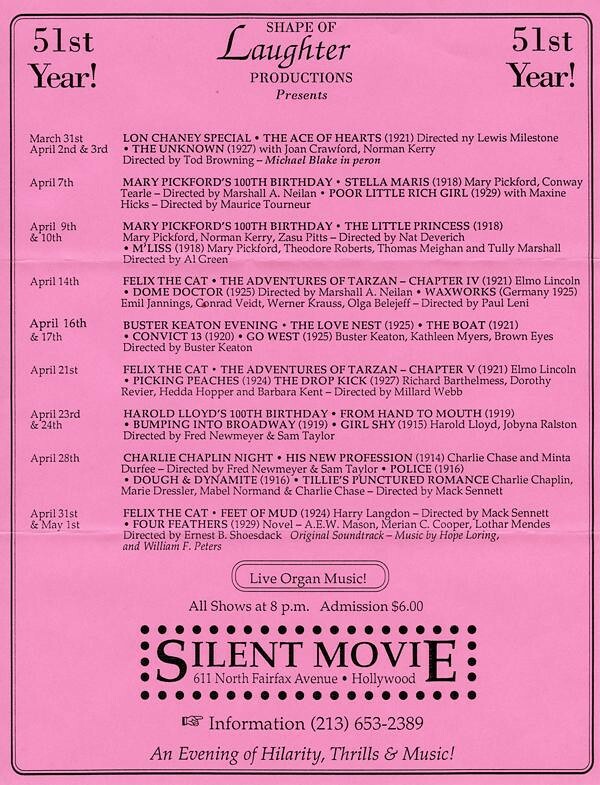 This is an original flyer from the Silent Movie Theater, 611 Fairfax in Hollywood, dated March 23, 1993. Come back, Silent Movie. Come back. That's from the Larry Austin era, not an "original" anything. John Hampton would be the original and only. Once Austin had got his oily mitts on it, The 'real" Silent Movie Theater was already a thing of the past. I cannot argue your point, Richard, the Hamptons were indeed the real McCoy. to where we are now -- there is precisely one silent film on the current schedule. Oh the memories, when the Silent Movie Theater regularly played silent comedies every week. I also remember these flyers and was a regular at the silent comedy nights. That's where I first saw THE GOAT and SAWDUST BABY on one of the comedy nights. No more these days. Thanks for posting the old flyer. Look at all them silent comedies being shown, with a Felix the Cat cartoon too. Complete with live organist. Was a lot of fun back then. Paul E. Gierucki wrote: I cannot argue your point, Richard, the Hamptons were indeed the real McCoy. Larry Austin was just another textbook example Hollywood parasite who basically conned and stole the Silent Movie Theater from Dorothy Hampton, and then his slimy life and finally death brought nothing to the memory of the place but notoriety. The owners of the place since then have been nothing more than an embarrassment. I said years ago on an old alt.movies.silent brouhaha about the place that the Silent Movie Theater was basically an uncomfortable place to watch John Hampton's incredible collection, when it and he were gone, it should have been leveled to make more parking for Canters Deli down the street. There are plenty of places way more comfortable to watch silent film in Los Angeles. Each succeeding operator of the place has done nothing but further destroy whatever reputation and good memories the place had. John is most likely spinning in his grave now at the thought of the crap currently being run on its screens. I use to believe I periodically attended showings at that theater during my four years I lived in LA. Now I read that the Hamptons shut down the place in 1979. I moved out there in the fall of that year. I guess my 'attendance' just consisted of driving by the empty building and looking in. Funny how time plays tricks with the mind.